I love steamed or sautéed spinach. I could eat pounds of it every day! 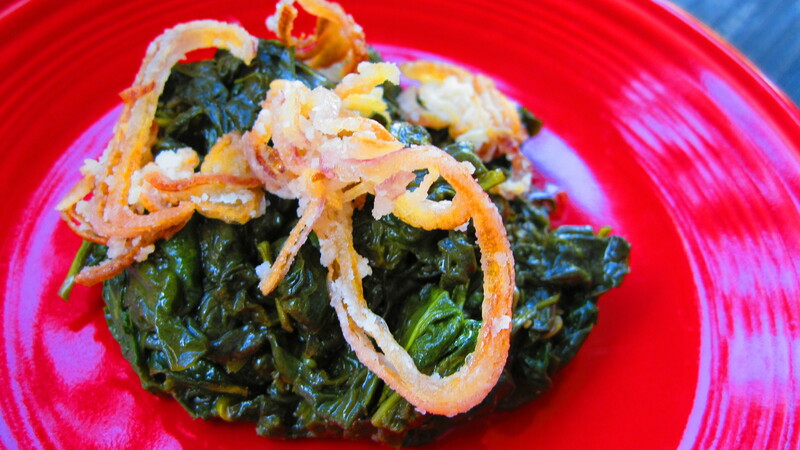 This recipe is fairly simple, but the crispy shallots add a punch of savoriness and texture. I have been experimenting with my approach to shallots for awhile. In the past, I would burn them or I couldn’t get them to crisp up. The secret here is low heat, cornstarch and a little patience. Heat vegetable oil in a small frying pan over medium-low heat. Slice shallots thinly and toss in bowl with cornstarch. Fry shallots in oil, stirring occasionally, until browned. This should take about 12-15 minutes. When shallots are browned, remove from oil and drain on a plate with paper towels. Wash spinach and spin dry. Heat olive oil in a medium-sized frying pan over medium-high heat. Add spinach in batches as leaves wilt in the pan. When all the spinach has been wilted, add broth, white wine and black pepper. Toss and cook for 5 minutes more, or until most of the liquid has cooked off. Use tongs to grab spinach from the pan. Let extra liquid drip off before putting the spinach on the plate.